blue manatee press, 9781936669738, 32pp. A is for Alligator, B is for Bear, and so on, right? Not in this book. The odd animals are taking over! It's time to meet Aye-Aye, Fossa, Numbat, Xenops and more curious, yet real animals that are ready for their spotlight. Laugh along as they introduce the letters of the alphabet in their own odd way! June Smalls is a member of the Society of Children's Book Writers and Illustrators and a lover of literature. Residing in Northern Virginia, she splits her time between visiting zoos with her family and writing at home with her own odd assortment of animals. Claire Sedovic is an illustrator and graphic designer living in Des Moines, Iowa. 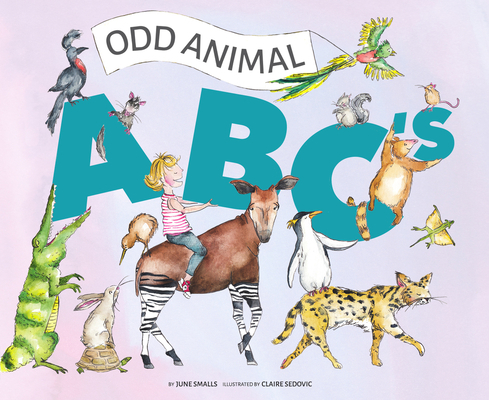 Odd Animal ABC’s is her first children’s book.